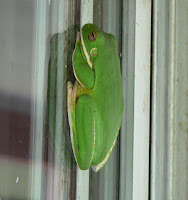 A green blob on the outside of our bedroom window yesterday and now this Giant White-lipped Tree Frog has relocated to the office window, where he's been asleep all day. 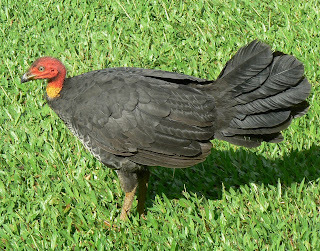 At only 8cm, or just over 3 inches, he's quite a small specimen as they can grow up to about 14 cm. Daintree is looking so utterly magical at the moment - after the recent rain all the vegetation has an incredibly vibrant lushness to it, and if we thought there were a lot of butterflies a few days ago, well now there are hundreds! Guests who arrived this afternoon could not believe their eyes!